The crew received a fourth-place medal, besting 31 teams in the collegiate eights division. 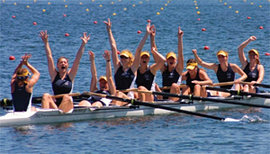 “To get medals at such a prestigious race is very exciting,” says co-commodore Aliyah Emas ’10. The Bombers had a successful fall season, winning the collegiate eights event at the Head of the Genesee in Rochester and finishing second at the Head of the Fish in Saratoga Springs.